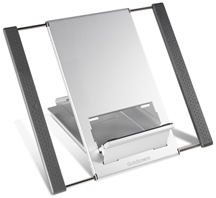 From Goldtouch work with comfort and ease in the office or on-the-go with tablet and laptop desk stands. An adjustable laptop or tablet stand will optimize the position of your screen, helping you to re-create the comfort of your home workspace wherever you go. Shop our selection below and take your first steps towards making your office fit you.